What Is PlayStation Plus, and Is It Worth It? If you have a PlayStation 4, Sony’s PlayStation Plus service is required to play multiplayer games online. A subscription costs $10 per month or $60 per year. PlayStation Plus also includes additional benefits, like free games every month and members-only discounts on some digital games. PlayStation Plus is Sony’s online gaming subscription service for the PlayStation 4. It’s required to play online multiplayer games on the PlayStation 4. Whether you’re playing a competitive multiplayer game with people you’ve never met or a co-operative game with a friend who lives a few blocks away, you’ll need PS Plus to do it. Sony has also added some additional features to this service. Only PlayStation Plus members can upload their game saves, storing them online where they can be accessed on another console. PlayStation Plus members get some free games every month, and they also get access to some bonus sales on digital games. RELATED: What Is Xbox Live Gold, and Is It Worth It? On the PlayStation 4, Sony’s PS Plus works exactly like Xbox Live Gold on the Xbox One. It’s required for online multiplayer gaming. However, if you have a PlayStation 3 or PlayStation Vita, PlayStation Plus is not required for online multiplayer gaming. You can play online games for free. PS Plus still gives you access to some free games and sales if you have a PS3 or Vita, but it’s much less critical than it is on a PS4. 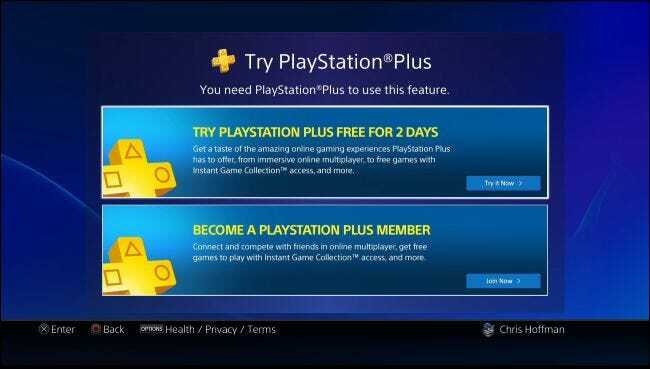 If you want to play online multiplayer games on your PlayStation 4, you’ll need PlayStation Plus. That’s just how it is. 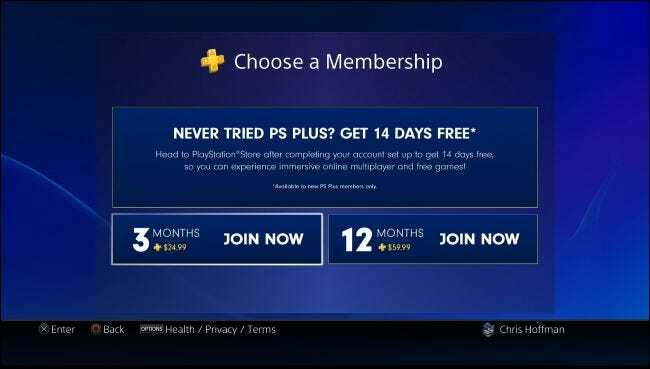 If you try to use the online multiplayer features within a game without subscribing first, you’ll see a message informing you you need PS Plus. PlayStation Plus isn’t required for playing single-player games, and it isn’t required when playing multiplayer games if everyone playing the game is sitting in front of the same console with a controller. It’s only required for online gaming. This service also isn’t required for using other online features, including media apps like Netflix and YouTube, or the PS4’s web browser. You can use all these features even without a subscription. 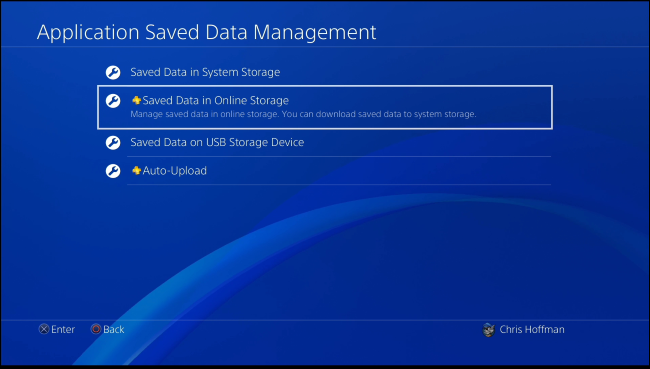 On the PlayStation 4, PS Plus also allows you to use online storage for your save games. Your PS4 automatically uploads your save games to Sony’s servers, and you can download that save data on another console—or the same console, if you’ve deleted the save games. This ensures you always have a copy of your save games, even if your PlayStation 4 console dies and needs to be repaired or replaced. You’ll find this feature on the Settings > Application Saved Data Management screen. The yellow plus signs next to the “Saved Data in Online Storage” and “Auto-Upload” options means these features require PlayStation Plus. How Do The Free Games Work? Every month, Sony offers several free games to PS Plus subscribers—sometimes known as “Instant Game Collection” games. 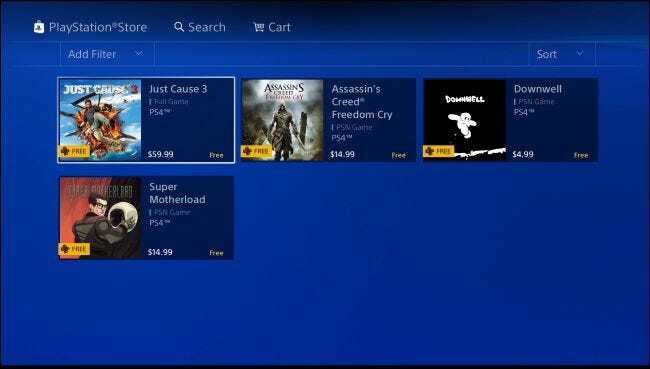 During the month these games are available, you can choose to “buy” them for free on the PlayStation 4. You can then download the game for free. You get to keep it, too—you can download and play it a year from the day you “purchase” it, if you’re a subscriber. If you don’t redeem the game while it’s free for a month, you don’t get it for free. This means you won’t get any of the previously free games when you subscribe to PlayStation Plus. It also means that, if you don’t download your free games every month, you’ll miss some and won’t get them for free. However, gamers who have been members of PS Plus for a long time may have a library full of hundreds of games they acquired for free. The free games Sony offers always include a mix of games for the PlayStation 4, PlayStation 3, and PlayStation Vita. If you only have one of these consoles—for example, if you only have a PlayStation 4—you’ll only be able to play the games for that console. You can’t play a PlayStation 3 or Vita game on the PlayStation 4, although some of the free games may be available for multiple consoles. You can view the current free games for PS Plus subscribers on Sony’s website, and a list of games Sony has previously given away on Wikipedia. As of August 2017, you’ll see quite a few indie games and older big-budget games. Don’t expect the latest big-budget games on their release date, although you may see them for free several years after their release dates. How Do The Deals Work? Some of the sales on the PlayStation Store are only available for PlayStation Plus subscribers. Other sales offer a higher price for non-subscribers, but a cheaper price for subscribers. In this case, you’ll see two separate prices for an item on the PlayStation Store. The yellow price with a plus sign is the price for PlayStation Plus subscribers, while the white price is for non-subscribers. Sony is often running some sale or another, but those sales aren’t always amazing. Bear in mind that you generally won’t get a discount on big new games as soon as they come out. Discounts are typically available only on older big games, or perhaps newer small indie games. Whatever you purchase through these sales is yours to keep, even after your subscription expires. Overall, the big benefit to PlayStation Plus is the ability to play online multiplayer games. PS Plus is absolutely worth it if you want to play multiplayer games on your PlayStation 4. Paying for this feature is now pretty standard. Microsoft’s Xbox Live Gold pioneered charging for online multiplayer with the Xbox 360, and Sony’s PS Plus now costs the exact same amount of money as Microsoft’s Xbox Live. Even Nintendo will soon begin charging a subscription fee for online multiplayer on the Nintendo Switch. Every game console has started charging for online multiplayer, so the only way to play online games for free is to switch to a PC—or stick with a PlayStation 3. The other features are a bonus. Sony does offer quite a few games for free, so you can get a steady stream of free games to play if you’re patient. However, if you just have a PS4, you’ll only get a few free games every month and won’t be able to play every one of them. You’re also limited to only the games Sony chooses for you, and you may not like the selection at times. The deals are nice to have, but they’re not consistent and you can’t count on finding a sale on something you’ll like. You can always buy used physical games, anyway—those are often cheaper than buying digital games. You can get a fourteen-day free trial of PlayStation Plus on the PlayStation Store. 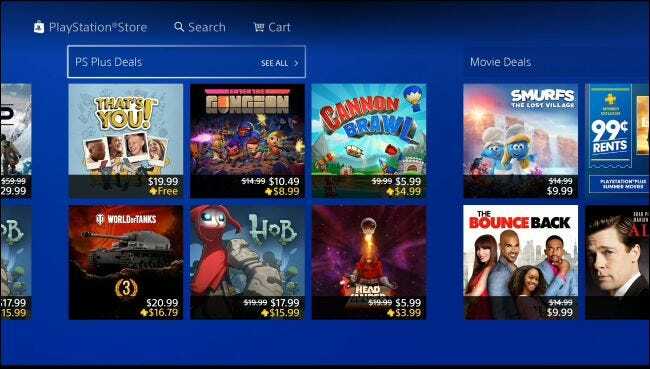 Some games, and the PlayStation 4 console itself, may also come with a printed PlayStation Plus trial code you can redeem on the Store. When purchased from Sony, PS Plus costs $10 per month, $25 per three months ($8.33 per month), or $60 per year ($5 per month). If you know you’ll want PS Plus for a year, the yearly subscription is the best deal. However, you can’t cancel it and get your money back if you change your mind after a few months. That’s the downside. If you do opt for the free trial, be careful because it will automatically begin charging you for a monthly membership afterwards. You may want to cancel the subscription or switch to a yearly membership rather than pay $10 per month. You can also buy PS Plus time cards at retail stores, although they’ll cost the same as a subscription through Sony unless you can find them on sale. RELATED: What Is PlayStation Now, and Is It Worth It? There is actually way to play PlayStation 3 games on the PlayStation 4—kind of. It’s through Sony’s PlayStation Now service, which requires a separate monthly fee. This service actually plays the games on Sony’s servers and “streams” them to you. It gives you access to a separate library of games.